RF and microwave laboratories face common challenges in these times. They include shrinking timelines for acquisition of accurate test results and leaner financial budgets. 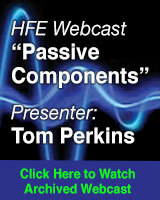 Formidable present-day laboratory challenges include integrating radios with embedded designs which add a new twist. New EMI challenges abound. Specific protocol events need to be triggered upon, and result tables exported for further analysis or documentation. Low speed serial bus data can be captured with oscilloscopes, and with analysis software, can be decoded and validated. Also, obtaining high fidelity bench power is a necessity. Power rail tolerances are getting tighter and more difficult to measure. There are many power rails in designs for devices such as CMOS amplifiers, Application Specific Integrated Circuits (ASICs) and DRAMS with voltages such as -5, +1.2, +3.3, +5 and sometimes higher for devices such as GaN amplifiers. Sleep and wake modes are critical for proper control of circuitry. Recently Rohde & Schwarz, generally known for high quality but expensive test instruments, showcased a new generation of Value Instruments for High Frequency Electronics. The take-way was that a great amount of capability is packed into smartly designed instrument cases weighing approximately 10 pounds which will revolutionize electronics hands-on in education institutions, research and development facilities, small business production laboratories and even hobbyist benches. 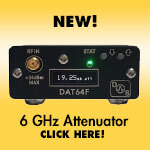 These types of instrument products, not all unique to R&S, are creating a new paradigm in lab measurements. The units demonstrated are so compact and lightweight that if handed to someone wearing a blindfold, they might think it is a shoebox, or upon feeling the controls, that it is only a mock-up instrument. Certainly not your father’s or grandfather’s rack or rolling wheeled cart mounted equipment. In this case the supplier introduced “a portfolio of entry-level to mid-range value instruments, promoting five key technologies.” Included are more than 100 products and 300 accessories including oscilloscopes, spectrum analyzers, precision power supplies, and signal generators. (See Figure 1). Figure 1 • Family of Value Instruments. Designed with the high quality and precision that users have come to expect of Rohde & Schwarz, the new value instruments are manufactured at the same European plants as the company’s higher-end products. With more than eight decades of experience and renowned German engineering, the company’s value instruments provide the performance needed for measurement tasks in everyday laboratory operations at universities and research and development facilities. Oscilloscopes were originally called oscillographs. Digital displays and added capabilities may eventually be a catalyst for name change again. 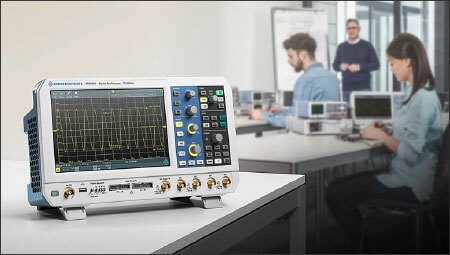 Modern value-class oscilloscopes go far beyond the features of a traditional oscilloscope; these instruments include a logic analyzer, protocol analyzer, waveform and pattern generator and voltmeter in the same instrument. For example, featuring the power of 10, these value instrument oscilloscopes include a class exclusive 10-bit analog-to-digital converter (A/D converter), 10s of Msamples of memory and a 10.1-inch touchscreen offering the highest resolution in its class: 1280x800 pixel. The technology’s 10-bit A/D converter provides sharper waveforms and more signal details, compared to conventional 8-bit A/D converters, yielding up to four-fold improvement. Figure 2 • Value Oscilloscope Live Demonstration. Users desire features such as lower cost with more performance, large touchscreen displays, and more vertical resolution. The RTB2000 oscilloscope (see Figures 2 and 3) features a 10.1-inch capacitive touchscreen that allows users to quickly navigate pop-up menus and adjust scaling by zooming in or moving a waveform. A memory depth of 10 Msample is available on every channel if all channels are active, or users can benefit from 20 Msample when channels are interleaved. Ten times more memory than comparable oscilloscopes is offered, allowing users to capture longer signal sequences for more analysis results. The oscilloscope features a frequency range of 70 to 300 MHz. Utilizing state-of-the-art A/D converters and low-noise frontends, the oscilloscope can precisely measure very small vertical resolution. Combining the product’s smart operating concepts with the power of 10 makes it the ideal tool for troubleshooting embedded designs during development, or for use in settings such as university laboratories, production and service departments. 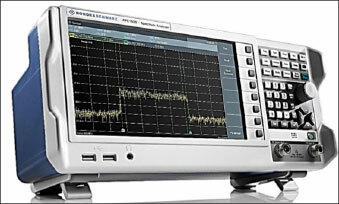 Stepping up, the RTM3000 oscilloscope offers a greater frequency range of 100 MHz to 1 GHz. The oscilloscope features a custom 10-bit A/D converter to deliver four-fold improvement over conventional 8-bit A/D converters, providing users with sharper waveforms and more signal details. As with the RTB2000, the RTM3000 features a 10.1-inch capacitive touchscreen in compact form. This is the largest capacitive display with the highest resolution (1290 x 800 pixel) in its class. Figure 3 • Value Instruments in College Laboratory. 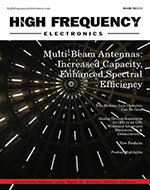 HFE personnel were next introduced to the FBC1500 Spectrum Analyzer (See Figure 4). This unit had a vertical antenna attached to an input port and of course noticeable signals appeared to be local cellular activity, as expected. Local 4G LTE activity can be seen below 800 MHz as well as perhaps traditional cellular signals closer to 900 MHz. Speaking of value, some entry-level spectrum analyzers costing less than $3,000 are the only ones on the market with the value and capabilities of a three-in-one instrument – a spectrum analyzer, vector network analyzer and a signal generator. Featuring a frequency range of 5 kHz to 1 GHz, the FPC1500 (see Figure 5) can be upgraded to 2 GHz or 3 GHz high end frequency limit. It has a low noise floor, -165 dBm (typical with a preamplifier). In addition to being able to measure RF signals up to 1-watt (+30 dBm), it is also an RF signal generator and features a tracking generator and an independent continuous wave (CW) signal generator. 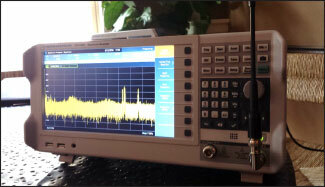 Figure 4 • Live Demonstration of Value Spectrum Analyzer with Whip Antenna Receiving Over the Air Signals. It also includes a one-port vector network analyzer with a Smith Chart display, a signal generator, internal voltage standing wave ratio (VSWR) bridge, independent signal source and resolution bandwidth settings down to 1 Hz. It includes a 10.1-inch Wide XGA/WXGA (1366 x 768 pixel) display, is Wi-Fi-enabled and includes a remote-control capability. It is compatible with iOS, Android and PCs and features a low noise floor and high maximum input power. Data can be stored to these devices and then saved, stored, and if desired, sent to a printer. 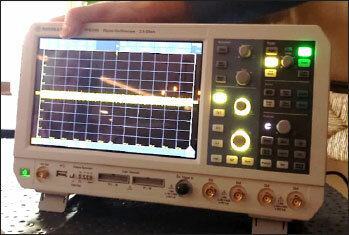 Figure 5 • Value Instrument Spectrum Analyzer. As the only power supply on the market featuring four channels, while obviously not the solution for everybody, the R&S®HMP4040 power supply (Figure 6) offers a maximum voltage of 128 V and maximum current of 40 A, up to 10 A output current per channel. Up to 160 watts of channel power can be had, and unlike other power supplies available on the market, the product offers identical voltage range on all channels. It comes standard with a dual USB/LAN interface and locates all basic functions on the front panel to allow for direct access. Figure 6 • 4 Channel Programmable Power Supply. Offering high efficiency and low residual ripple, the product includes a wide variety of protection features to prevent damage to the instrument and the device under test (DUT), such as overtemperature, overload and short-circuit protection. Sleep and wake modes are critical and can be managed from a coordinated Wi-Fi interface. We noted that due to the ability to make voltage additive, applications like electroplating and powering GaN high power amplifiers are quite feasible. 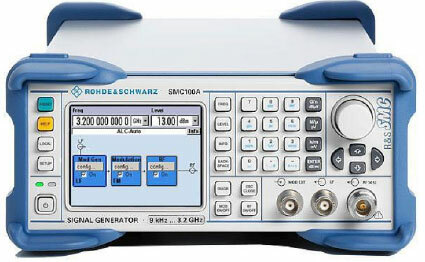 Another interesting product is the signal generator, such as the model SMC100A shown in Figure 7. Here, the manufacturer claims that the “graphical interface allows you to set up the signal the way you think about it.” It mimics the functional blocks of a transmitter. Functional highlights are: output frequencies of 9 kHz to 1.1 GHz or 3.2 GHz, output power up to 50 milliwatts, low phase noise typically -111 dBc, AM/FM/phase/pulse modulation, optional reference oscillator, optimized level accuracy, USB and LAN, and optional GPIB. This is a very useful tool particularly for classroom training purposes and circuit design work. Figure 7 • Value Instrument Signal Generator. It is perceived that there is a large, untapped market for value instruments like the ones previously described. There are other specific instruments useful in RF labs such as those made by competing companies or in some cases, complimenting ones such as low-cost network analyzers and power meters that certainly deserve mention. Since the equipment described in this article is principally not “vendor neutral” (a play on words!) we mention other companies like Anritsu, Copper Mountain, Fluke Corporation, Keysight, LadyBug Technologies, Mini-Circuits, National Instruments and Tektronix. Some of these companies provide cost effective instruments that rely on computers such as ordinary laptops for fulfillment of functionality. That saves capital expenses. Worthy of note, Tektronix reports to have sold more than 1 million oscilloscopes based on their TDS2 platform, the latest being the TBS 2000 series (Figure 8). Figure 8. 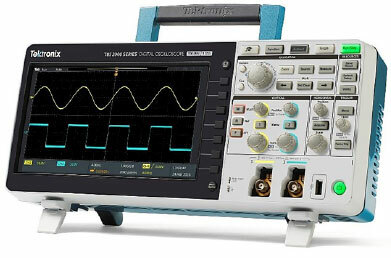 Tektronix TBS 2000 Series Digital Oscilloscope. It should be noted that not all these companies are on the same “playing field,” but certainly deserve consideration when weighing test equipment needs such as their application, ease of use, durability and cost. This value instrument trend will no doubt grow and flourish going forward. HFE’s thanks to Rich Markley, Distribution Product Manager for Rohde & Schwarz USA and Erica Harbison of Blu Print Public Relations for their December briefing.